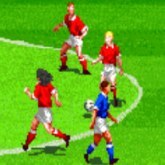 Description: Super Sidekicks is a fast action soccer game that used to be popular in Arcades back in the 90's. Choose from 12 teams from around the world and compete for the SNK cup. The energy, sound, hype and goal announcer make this one exciting to play. If you like soccer and games this one is a clear winner. Game Controls: Shift Key = In-cert Coin. Enter Key = Start. Arrow Keys = Move. "Z, X, C" Keys = Action Buttons. See In-game Controls for more options, by "clicking" controller in the bottom left corner of the game screen.